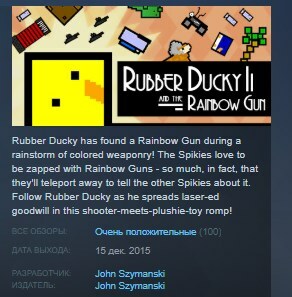 Rubber Ducky is a quiet individual who has had the fortune of finding a Rainbow Gun during a rainstorm of colored weaponry. Mr The Tree informs him that the Spikies love to be zapped with Rainbow Guns. Being rather genial, Rubber Ducky decides to spend his day going around and zapping things. He's a Duck, you're a Duck! Control Rubber Ducky, a square version of everyone's favorite fowl, as he spreads his laser-joy! Take Rubber Ducky through some pretty spunky places, like the Digital Place, the Home of the Teleporting Penguins, and the Rather Spunky Badlands with frenetic side-scrolling action! Rubber Ducky knows a lot of people, like the Floating Lizards, the Accordion, Mr. The Tree, and the Teleporting Penguins! Crazy beats are everywhere! And are those backgrounds dancing along in time? 'Dat's right! Get some swag goin' by changing up your costume! Great as a Virtual Stocking-Stuffer! With the gift-giving season right on us, pick up some Rubber Ducky copies to give out to the friends you like at least a bit, but not a ton!